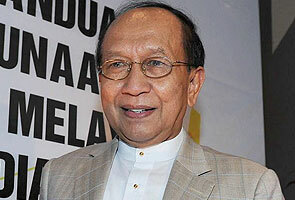 KUALA LUMPUR: Barisan Nasional (BN) leaders not nominated as candidates for the 13th General Election (GE13) should respect the decision made by the top leadership in not picking them, said Information, Communications and Culture Minister Datuk Seri Dr Rais Yatim. He said anyone calling himself a leader should be able to face reality when his or her "time was up". "We must respect the decision made by the top leadership. We should not, after having been a leader for a long time, suddenly decide to go against the party just because we have been dropped," he told reporters at his office here today. He said this when asked to comment on the action of some BN leaders and former leaders who opted to go the independent route because they were dropped as candidates for GE13, polling of which is on May 5. Rais, a three-term MP of Jelebu who was also dropped from the BN candidate list this time around, said the BN leadership should also be quick to act on the issue of party hopping. "To me, one must learn a lesson from those who jump, regardless if he is a top or moderate-level leader. Furthermore, he said efforts must be made to prevent the leader's followers from following suit and deviate from the struggle of the party. "To me, a general must not run away from a fight except if he is followed by many who are like minded. "I regard the action of a leader who jumps ship and becomes an independent alone without being followed by others as one who will not be well-received," he said. Rais added that in the world of struggle "we should draw from the positive values of our group." Rais, 71, who has served under five prime ministers since Tun Abdul Razak Hussein and now under Abdul Razak's son Najib, said:" This is a difficult thing (being dropped)." Hal ini memang sukar." "But we must be able to face reality, because a person who leads cannot forever remain as an elected representative or minister, or hold a certain post," said Rais, whose political career started off as parliamentary secretary to the Culture, Youth and Sports Ministry in 1974 at th age of 32. He said BN and Umno leaders who were dropped should not opt to desert at crucial moments. He said these leaders after gaining so much while they were in the party should not "bite the hands that feed them." "We should not practice such a stand. We should not follow one or two who have done so, namely, disgruntled leaders," he said. He said they must be aware that their actions "will be scrutinised, credibility questioned and cannot face those who had been supporting them all along." He added:"As an 'old timer' in the government and party, in a struggle there is sadness, happiness, losses and profits but we must not disappoint the Prime Minister who has fostered the spirit of togetherness for us under the 1Malaysia concept, his deeds and other positive steps."